Queen Dawn was probably my best queen - her bees were gentle, healthy and productive. I say "was", because regrettably I lost her to a swarm. Yes, all the hives have swarmed now. 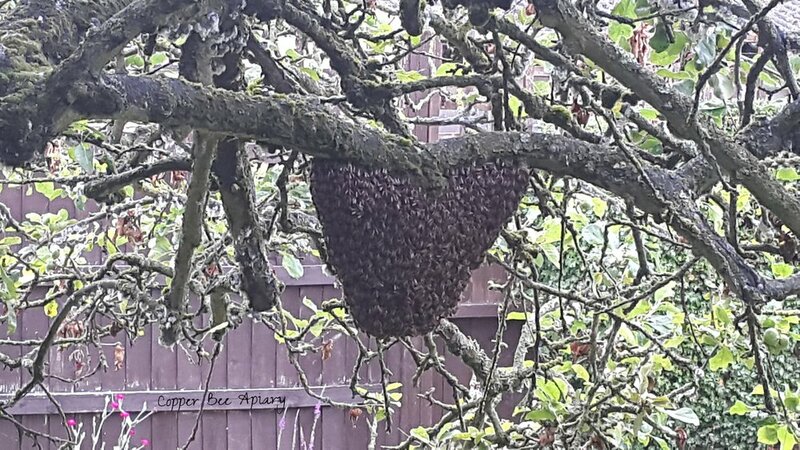 So much for my swarm prevention measures. That's what they usually look like, i.e., blanketed by bees. In fact, so loyal are the bees that they stay with the queen cells even when you remove the cells from the comb. If you're really ruthless about preventing further swarms ("cast swarms") from a hive after the queen's departure with the primary swarm, you need to go through the whole brood box at this point, shaking the bees off every frame and removing every queen cell except one - that one you leave to let a single new queen emerge to replace the old queen. So you need to make sure that the one cell you leave is a good one. But how do you, a mere human, judge the content of wax chambers built by the bees? You cannot sense the pupating queens inside or communicate with them. You cannot even know whether a sealed cell contains a queen at all, let alone what she is like. So I hedged my bets and left two queen cells in the Copper Hive brood box. Two really good-looking ones, of course. Both, it seems, held viable queens who duly emerged into the hive. Proof of this came yesterday afternoon when one of them took off with a cast swarm. When I returned home in the evening, they were hanging out in next door's apple tree. And there they stayed, holding tight to the branch despite the heavens sending some torrential downpours of the type that make you hope the glass in your windows is strong enough. When my neighbour got home I went round and tucked the swarm safely into a skep for the night. Branch above, bees (mostly) below. Meanwhile, the queen who emerged from the second queen cell has also been making her presence known. She has been piping to announce her arrival as queen of the Copper Hive. While I was in the garden yesterday evening contemplating the swarm next door, the sound of piping was clearly resonating from the Copper Hive. I took a couple of sound recordings, holding the microphone near the hive. In this first recording, you can hear the new queen begin to pipe. She has a voice like an oboe. Each pipe is a long note followed by several short ones. In this second recording, you can hear her pipe twice. My own concert from the piper at the gates of Dawn.